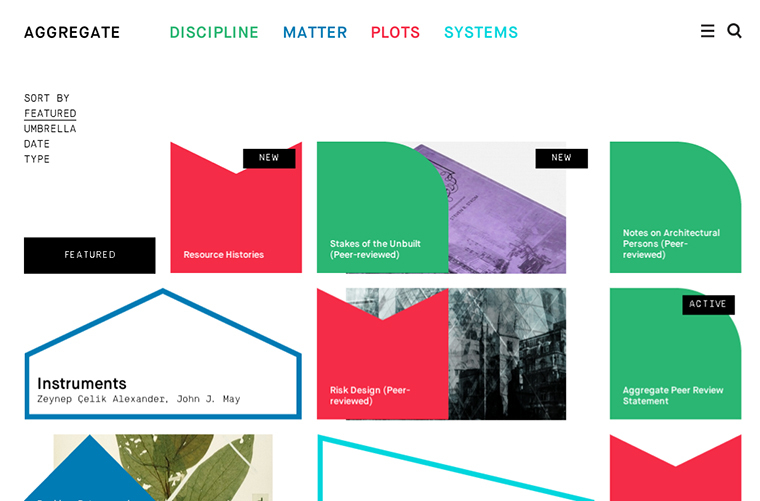 Project Projects, Aggregate Architectural History Collaborative, Aggregate Website Design, 2013. All rights reserved. Since 2006, the Aggregate Architectural History Collaborative has constituted an independent forum for sharing ideas, workshopping research, and publishing scholarship that expands the boundaries of architectural history. With Graham Foundation support, we have now created an online platform that opens this process to colleagues in architectural history and related disciplines. The Aggregate Website combines digital authoring tools and content management systems with partnerships for print and online publication in order to support the submittal, development, open peer-review, and publication of scholarship for specialists, students, and wider publics. By assembling groups of scholars to work together on topics of collective interest, workshopping their ideas, and publishing the results, we aim to spur new forms of research, collaboration, and publication. The Aggregate Architectural History Collaborative is a collaborative of scholars interpreting architecture from multidisciplinary perspectives, with a commitment to methodologically innovative and rigorous work that reconceptualizes the boundaries of our discipline in order to accommodate deeper discussions of materiality, politics, technology, economy, ecology, and aesthetics. We have conducted several workshops and organized a symposium, resulting in the April 2012 publication of Governing by Design, a collection of ten essays that analyze the interaction of architecture with economics and politics during the twentieth century. Daniel M. Abramson is associate professor and chair in the Department of Art and Art History at Tufts University. He is the author of Building the Bank of England: Money, Architecture, and Society, 1694–1942 (Yale University Press, 2005) and Skyscraper Rivals: The AIG Building and the Architecture of Wall Street (Princeton Architectural Press, 2001), as well as many journal articles and reviews, and he is a board member of the Society of Architectural Historians. Zeynep Çelik Alexander is assistant professor in the Daniels Faculty of Architecture, Landscape, and Design at University of Toronto. Her work focuses on histories and theories of architecture since the Enlightenment with an emphasis on German modernism. After architectural training at Istanbul Technical University and Harvard University, she received her PhD at the Massachusetts Institute of Technology (MIT). Her awards include a postdoctoral fellowship from Columbia University and predoctoral fellowships from the National Gallery of Art, the Social Science Research Council, the Dedalus Foundation, DAAD, and the Max Planck Institute for the History of Science. Alexander is currently completing her book Kinaesthetic Impulses: Epistemologies of Aesthetic Modernism circa 1900. Lucia Allais is assistant professor at the School of Architecture at Princeton University, specializing in the history of twentieth-century architecture, urbanism, and preservation. A former member of the Princeton Society of Fellows, she is currently turning her dissertation Will to War, Will to Art: Cultural Internationalism and the Modernist Aesthetics of Monuments, 1932–1964 into a book. Allais has received fellowships from the National Gallery of Art, the Graham Foundation, the Gunzburg Center for European Studies at Harvard, the ACLS, and the Woodrow Wilson Foundation. She has worked in design firms in Europe and the United States, including OMA-AMO and 2x4. Arindam Dutta is associate professor in the Department of Architecture at MIT, where he directs the SMArchS Program. Dutta obtained his PhD from Princeton University in 2001, and he has degrees in architectural design from the Harvard Design School and the School of Architecture in Ahmedabad, India. Dutta's articles have appeared in the Journal of Society of Architectural Historians, Grey Room, the Journal of Arts and Ideas, and Perspecta, and he is the author of The Bureaucracy of Beauty: Design in the Age of its Global Reproducibility (New York: Routledge, 2007). Edward Eigen is an architectural historian and scholar whose work focuses on intersections of the human and natural sciences with architecture in the nineteenth century. An associate professor in the Graduate School of Design at Harvard University, he has previously taught at City College of CUNY and at Princeton University, where he won the 2005 Graduate Mentoring Award. He is currently preparing to publish the book An Anomalous Plan, which discusses a system of novel sites, instruments, and institutions for researching the natural environment. John Harwood is associate professor of modern and contemporary architecture in the Department of Art at Oberlin College. His research centers on the architectural articulation of science, technology, and corporate organization. His articles have appeared in Grey Room, AA Files, and do.co.mo.mo. He is coauthor, with Janet Parks, of The Troubled Search: The Work of Max Abramovitz (2004), and coauthor with Jesse LeCavalier and Guillaume Mojon, of This—Will This (2009). His book The Interface: IBM and the Transformation of Corporate Design, 1945–1976 was published in 2011 by the University of Minnesota Press. Timothy Hyde is associate professor of architecture at the Harvard University Graduate School of Design, where he teaches courses in history and theory and serves as area coordinator for the History and Philosophy of Design concentration for the master’s degree in design studies. Hyde is currently pursuing an extended study of entanglements between architecture and law, research that includes his forthcoming book Constitutional Modernism: Architecture and Civil Society in Republican Cuba (University of Minnesota Press). He received his BA from Yale University, MArch from Princeton University, and PhD from Harvard University. Pamela Karimi is assistant professor of art history at University of Massachusetts Dartmouth. Her research on the art, architecture, and visual culture of the modern Middle East has appeared in Persica, Perspecta, the International Journal of Middle Eastern Studies, Art Journal, Thresholds, Bidoun, the Arab Studies Journal, CAA Reviews, and the Encyclopedia of Women and Islamic Cultures. Karimi is completing Domesticity and Consumer Culture in Iran: Interior Revolutions of the Modern Era (under contract with Routledge). She is editor of H-AMCA, the online network of the Association of Modern and Contemporary Art of the Arab World, Iran, and Turkey. Jonathan Massey is an architect and historian with degrees from the University of California, Los Angeles and Princeton plus practice and teaching experience in Los Angeles and New York. Formerly the Laura J. and L. Douglas Meredith Professor of Teaching Excellence at Syracuse University, where he chaired the Bachelor of Architecture Program and the University Senate, Massey is now Director of the architecture division at the California College of the Arts. His research, published in many journals and in Crystal and Arabesque: Claude Bragdon, Ornament, and Modern Architecture (2009), examines the ways architecture mediates power by giving form to civil society, shaping social relationships, and regulating consumption. Projects include the Transdisciplinary Media Studio and Marcel Breuer and Postwar America, curated with Barry Bergdoll and Syracuse students. John J. May is assistant professor in the Daniels Faculty of Architecture, Landscape, and Design at University of Toronto, as well as founding partner in FirstOffice, a Los Angeles–based design practice. He has also taught at the University of California, Los Angeles, where he was a UC Chancellor's Fellow and an associate researcher at the Institute of the Environment. May was named a 2010–11 Emerging Disciplines scholar by the Rice University Humanities Research Center, for "work that is shaping important new fields of inquiry." He holds an MArch with distinction from Harvard University and a PhD in geography from UCLA. Ijlal Muzaffar is an assistant professor of modern architectural history at the Rhode Island School of Design. He previously taught in the Department of Art History and the Center for the Study of Global Change at Indiana University, Bloomington. He received his PhD in 2007 from MIT, and holds an MArch from Princeton University and a BA in mathematics and physics from the University of Punjab in Lahore, Pakistan. He is writing a book on the role of modern architects and planners in shaping the postwar discourse on Third World development and its associated structures of power and intervention. Michael Osman is assistant professor in the Department of Architecture and Urban Design at UCLA. His scholarship focuses on the technological, environmental, and economic aspects of architectural history in the twentieth century. He has received numerous grants and fellowships including the University of California Humanities Research Fellowship (2011), a National Science Foundation Doctoral Research Grant (2006), and a Fulbright Fellowship (2002). Among his recent published writings are an exploration of Reyner Banham's writings on environmental control in the edited volume Neo-Avant-Garde and Postmodern (Yale University Press, 2010), as well as some thoughts on Hegel's theory of architectural origins in Log 22: The Absurd (Spring/Summer 2011). Meredith TenHoor is assistant professor in the School of Architecture at Pratt Institute and the author (with Rosten Woo) of Street Value: Shopping, Planning and Politics at Fulton Mall (Princeton Architectural Press, 2010) along with other articles, essays, and reviews. She is completing her dissertation, "Architecture, Food and Biopolitics from Les Halles to Rungis," at the School of Architecture, Princeton University. Aggregate Architectural History Collaborative, Inc., is a not-for-profit corporation dedicated to advancing architectural research and education for architects, scholars, students, and the interested general public. Founded in 2006, the group creates multi-disciplinary work that engages architecture's materiality, politics, technology, economy, ecology, and aesthetics. It produces scholarship and publications, conducts workshops and public events, and reflects on the methods and meanings of architectural research.